How about like father like daughter, too? The ‘problem’ sometimes with us kids is that too often we pick up the faults of our parents. But then is that the fault of the kid? I don’t think so. I am sometimes like my daddy. We like ice cream and playing in the park and wrestling and taking walks in the morning and looking at the computer while we eat. I don’t think that last one is a good thing. 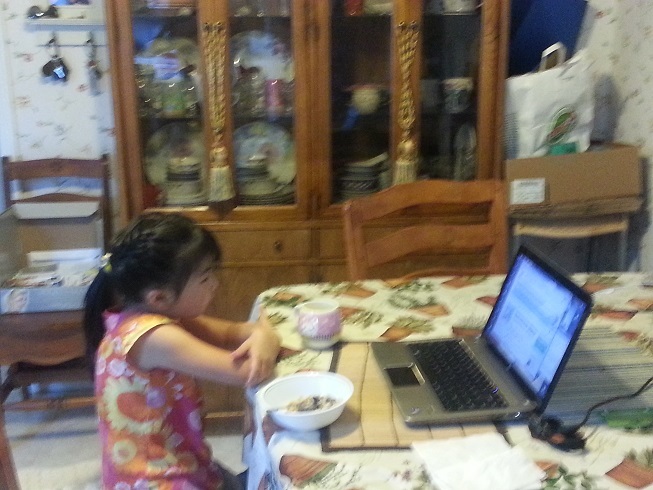 But daddy reads his computer sometimes while we eat breakfast. And sometimes while we eat dinner. No answer. He’s too busy looking at and pecking on his computer. So, now I am wondering. What other bad happies (Ed. habits) am I picking up from my daddy? Do I need to be careful? Or can I just depend on mommy to tell me when I am being too much like daddy? These questions are too hard for me right now. How about you dear reader? What happies (Ed. habits) have you picked up from your mommy and daddy? Good and bad?